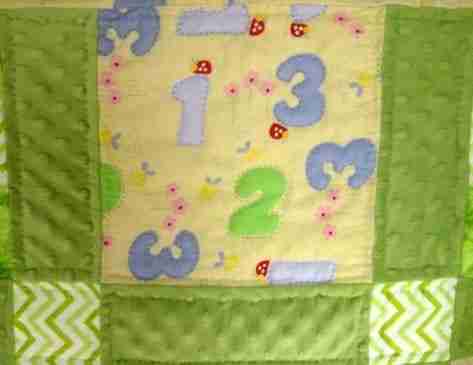 1,2,3 Green Light Go is a patchwork quilt is perfect for snuggling. These 100% cotton baby flannel blocks vary in patterns of pastel greens and compliment the pastel yellow number blocks are mixed with soft pastel green minky fabric. 1,2,3, this quilt is both durable and adorable. Backing material is the same green and white striped material featured on the front blocks. Size is 36 x 48 inches. Handed quilted for durability. Binding is hand stitched. Machine wash and dry. Hand quilted with love for your little bundle of joy by Sharon.